Designed to meets the Uniform Building Code, our structures feature a corrosive-resistant galvanized steel frame for strength and durability. Galvanized posts, purlins and hoops are used that conform to ASTM A53 Grade A requirements. 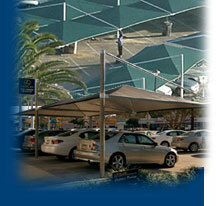 All steel is hot-dip galvanized which provides for total rust resistance on both the inside and outside. We use rust-free, stainless steel bolts that confirm to ASTM A307 and A325 requirements. Foundations 2500-3000 PSI /28 Day strength is used and all foundations are designed to meet local soil conditions. When installed to existing concrete slab, 8" X 8" baseplates are fastened with an epoxy anchor system. Steel is dipped in an acid bath to remove unwanted materials, then heated to remove welding impurities. Powder coating is electro-statically applied, then baked. 8 year guarantee on UV stability except Red which is guaranteed for 5 years. All colors are pigmented with a light fastness of 7 to 8 which has the highest resistance to fading. Fire Retardant material is available is select colors which has been approved and certified for the NFPA 701 and the California State Fire Marshall for small and large flame tests.